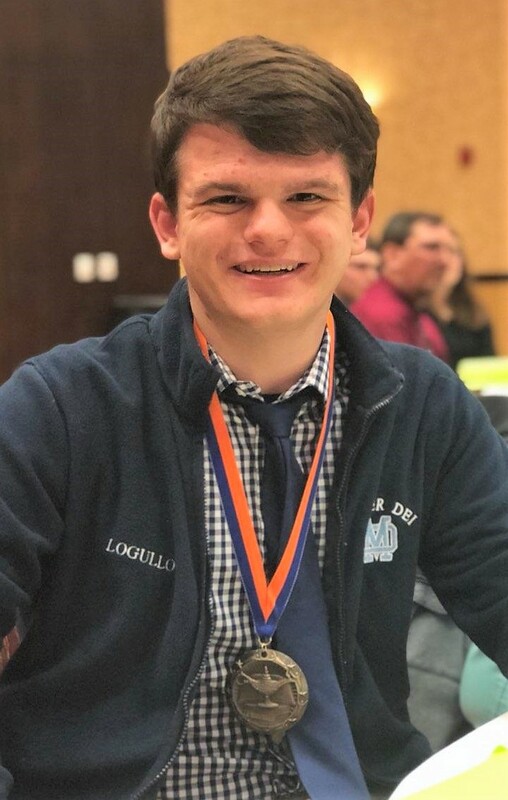 Senior Scholar Knight Ben Logullo officially concluded his high school scholastic bowl career April 14-15, when he was honored at the Illinois High School Scholastic Bowl Coach’s Association (IHSSBCA) banquet and competed in the NAQT 2018 Individual Player National Championship Tournament. Ben first travelled to Bloomington, where he was honored for his selection to the Second Team All-State in Class 2A. Ben is the first Mater Dei Knight to have earned this honor, as the player pool for the 2A large-school class is extremely deep and talented. Ben’s résumé, which led to the IHSSBCA honor, includes contributing to the team’s run to third place in IHSA Class A State as a sophomore, being instrumental in the team’s Sectional-runner-up season as a junior, and leading the team to a Sectional Championship and a trip to the IHSA State Championship Tournament as a senior. Ben then competed in the 2018 Individual Player National Championship Tournament in Chicago, where he capped off his impressive individual statistics by adding 30 toss ups to his year-end tally. Facing 95 of the top players in the nation, including players from California, New York, and Florida, Ben advanced from the seeding rounds to the first elimination round, which cut the field to 80 players; but he was unable to advance to the final 32 players. For the season, Ben amassed a school-record 451 toss ups. His career total of 699 toss ups is also a school record. Ben will attend the University of Alabama this fall, where he hopes to continue his scholastic bowl career in college. We congratulate Ben, as well as his parents, Jon and Stephanie Logullo, and thank him for his dedication and hard work! Senior Ben Logullo is pictured at the Illinois High School Scholastic Bowl Coach’s Association (IHSSBCA) banquet April 14, where he was honored for his selection to the Second Team All-State in Class 2A.